...En aquel Imperio, el Arte de la Cartografía logró tal Perfección que el mapa de una sola Provincia ocupaba toda una Ciudad; y el mapa del imperio, toda una Provincia. Con el tiempo, esos Mapas Desmesurados no satisfacieron y los Colegios de Cartógrafos levantaron un Mapa del Imperio, que tenía el tamaño del Imperio y coincidía puntualmente con él. Menos Adictas al Estudio de la Cartografía, las Generaciones Siguientes entendieron que ese dilatado Mapa era Inútil y no sin Impiedad lo entregaron a las Inclemencias del Sol y de los Inviernos. En los desiertos del Oeste perduran despedazadas Ruinas del Mapa, habitadas por Animales y por Mendigos; en todo el País no hay otra reliquia de las Disciplinas Geográficas. Suárez Miranda: Viajes de Varones Prudentes. Book Four, Chapter XLV, Lérida, 1658. Suarez Miranda: Viajes de Varones Prudentes. Book Four, Chapter XLV, Lérida, 1658. This, in the end, may be a map. Whether a map of the map is possible, whether the concept is a kind of map, depends on how abstract, ideal, intelligible, etc. a territory may be while still admitting of mapping. Once we accept this possibility, the very territory changes—there is no longer a single territory for which any differences in representation are solely those of precision, but rather topologies, and as many possibilities of cartography as there are whims of the mapmaker and the traveler. They are not constrained to the representation of space, and the representation of space is not a constraint. For one could just as well imagine the possibility of a becoming-time of space, a melody whose peaks and valleys followed the contour lines of a territory, for example. Just as this discourse, regardless of the arduous journey of its composition and the hopefully less arduous one of its reading, will always admit, a priori, of a spatialized representation in writing. As though it could be taken in at a glance—a perfect or perfectible knowledge remains the ideal of mapmaking, that one could gather all information into a form producing instant enlightenment. The choice of indexical representation, of a sign resembling in some way what it signifies, is the necessary co-constituent of this view, even if everything we have said about the possibility of the translation and metaphoricity of both map and territory suggests that there may be no limit to what could play this role. The task of mapping, as that of science, would remain unfinished. Franco Moretti’s cartographic literary criticism, for all its inventiveness, still participates in this myth of the perfectibility of knowledge. His work focuses on the creation of spatialized representations of literary texts, for example, a map of the settings of English estate poems or a network of the interactions of characters in Hamlet, from which he claims to gain insight into literary history and form. I am not as certain as Moretti seems here that we ever stand in a simple, punctual present severed from all past, nor that there is any medium or representation capable of guaranteeing the permanence of being. This dream of absolute, immediate presence is not the only sign that Moretti’s mapmaking and his notion of spatiality aspire to the disappearance of the act of reading. A certain formalism or morphology of literature is the necessary precondition of its mappability. To map the location or movement of picaresque novels or the Bildungsroman one must accept genre as a fact; to locate the heroes and villains of literature in this or that site these roles must be simple and unambiguous. Our hypothesis will be that it is no more possible in literature than outside of it (in Moretti’s methodology the territory is an imagined meeting place of the two), wherever that would be, to access any predicate, structural role, or form in its purity, devoid of any undecidability. If this is not a condition of impossibility of anything like a map, it at least guarantees that the territory shifts, that its representability is never exhaustible or saturable, for the simple and sufficient reason that the very act of mapping transforms it. The map is neither a factory nor a stage for Moretti—not a place of productions—and the ideal of its indexical relationship to some territory is the elimination of all artifice. Moretti’s methodology is everywhere justified by an invocation of the relations between the latent and the manifest: “Of maps, I mean, not as metaphors, and even less as ornaments of discourse, but as analytical tools: that dissect the text in an unusual way, bringing to light relations that would otherwise remain hidden” (Atlas 3). One could just as well read his conclusions as a form of petitio principii, placing behind the text what it pretends to discover there, “the ortgebunden, place-bound nature of literary forms” (Atlas 5).1 A literature firmly rooted and grounded in place, in a place that would precede it, would remain always outside the text, and would be capable of determining or destining the entire literary adventure of what we can recognize at a glance as Europe, is not a precondition of mappability but a precondition of the absolute status of those maps. Without a Europe prior to its literature, a territory in which its history can be thought as so many pushpins, the territory is transformed by its every re-imagination. If this ortgebunden quality is contrasted to “the internal logic of narrative” (Atlas 5, Moretti’s emphasis), it is because Moretti has made the mistake of thinking he can know with certainty what remains outside the text. Space, place, and even such a latecomer to the scene as his maps may be just as “internal” to the text as the logic they supposedly govern from outside. Moretti’s exploration veers dangerously close to the shores of this conclusion when it recognizes the novel as an “essential component” of the “modern culture” of the nation-states that give definition to his maps (Atlas 17). It may not be as simple as a glance at geography to guarantee that one has accessed a realm transcendent to the play of ideality, thought, art, or literature; after all, it was precisely there that Novalis met the eye of “this continent shaped in human form” (qtd. in Distant Reading). Book Four, Chapter XLV, Lérida, 1658. If the story imagines a distant Empire (no spatial coordinates are offered, but only the word “that,” not this—in other words: there, not here, other, not the same—the destination and possibility of every act of exploration) that once suffered a sort of cartomania, we should not be surprised to find, with Borges’ customary formal trickery, that the story is situated between ironic framing devices. A simplicity of the frame or border is necessary for the dream of the total map that underlies Moretti’s reveries, and the possibility of this simplicity is everywhere drawn into question in Borges’ work. Here, it is an opening ellipsis and closing attribution that situate “Del rigor en la ciencia” as a citation from an otherwise non-existent seventeenth century travelogue. If we would be naive to attempt to map this story alongside other travelogues from the conquistadors of that time, it is no less naive to think that even or especially an exemplar of a genre fits simply “within” its category, with no remainder. The vast discourse on orientalism is enough to remind us that when explorers targeted the most distant spatial or geographical coordinates, they nonetheless remained within their own fantasies, and thus that the genre of the travelogue had already in a sense attained self-consciousness. It is precisely the foresight of “Varones Prudentes,” Prudent Men, that subverts the rigor of their maps. What drives Borges’ cartographers is the motive force of Moretti’s dream of the total map as well: scale. If there is an implicit irony in the idea of a map the size of its territory, the logic is nonetheless rigorous that connects such a map to the “Perfection” of “the Art of Cartography.” Moretti too imagines the quantification of literature advancing to the stage where every detail could be accounted for in scientific terms, each finding its place in some map or network. Such a “point by point” correspondence of map and territory, coinciding “puntualmente” in Borges’ fictionally re-attributed words, is only possible if the territory is formed of points. The undecidability of form that Moretti’s project suppresses is precisely what prevents the details of literature, along with the geography co-constituted by it, from being understood as punctual. If these maps are described as "Desmesurados” it is not only for their immense size but just as much for their being out-of-proportion, offering a punctual correspondence for what never had a punctual form in the first place. The “unconscionable” chosen to translate this word by both Boyer/Morland and Andrew Hurley captures a different side of this word that can refer to an immoderate deed; it reminds us that being and thinking are here inextricably interwoven. If one were to map this story, where would it be placed? The question is not an idle one, as the fantastic quality of a story is no guarantee that it does not correspond metaphorically, allegorically, or otherwise to one or more of the discursive entities we consider historical times and places, just as “realism” never offers a freedom from all imaginative construction. In this respect, the brilliant analysis of postcolonial themes in Borges’ stories by Gina Apostol provides the matrix for an endless re-reading of his work, one which transforms this piece as well. In “Borges, Politics, and the Postcolonial,” she describes the postcolonial condition as that of finding oneself living within another’s fantasy, dream, or text, an almost universal condition for Borges’ protagonists. The “Succeeding Generations” who follow these perfect cartographers find themselves in just such a condition, treading a ground woven of the dreams of the past. The result is a complex superposition of time and place, marked by ambiguities that could perhaps be reproduced in a map, but never isolated or eliminated by one.2 Where should we place the “deserts of the West” said to house the “mangled Ruins of the Map?” (How does a map become a ruin? Not simply by lack of care, by a discoloration or fraying of the borders, but by outliving its world, the one it helped to construct, by remaining on as a kind of index or map of the dream of totality it has outlived.) The West described here could be Argentina, whose pampas dominated so much of Borges’ imagination. Or perhaps some colonized land is described here as a desert of the West, of the European explorers who in a certain sense created it. Are the “beggars” who inhabit these deserts those who borrow their language and their literary forms (which, nonetheless, Moretti is overhasty in assuming to be the proper possession of Europe) from the dreamers who have always already departed? Even if this story can be placed “in” Argentina, that makes it no easier to say which Argentina, or whose. The question is no simpler than at the conclusion of Borges’ story “El Sur,” when it is impossible to say whether the pampas of Argentina are the land of life, death, or afterlife, reality, fiction, or fantasy, that of Borges, his narrator, or his character, etc. And it is not a matter here of a polysemy whose possibilities could be exhausted by a certain number of maps — the very effort toward representation and mastery creates new strata, awakens and suppresses content, and shifts the territory it attempts to map. We shouldn’t think that these reflections are irrelevant to Moretti’s project because they take the example of a text that, regardless of its abyssal play with genre, is certainly not a novel, the genre to which Moretti limits many of his studies. We are attempting to identify the essential conditions of (im)possibility that anything like writing places on anything like a map. Our conclusions would not only be applicable to novels of the genre Utopian, fantastic, speculative, etc., as we have tried to show that even the most “realist” attempt (whether in literature or the humanities) to represent place necessarily re-opens and dehisces the lack of self-identity of a never originally unified situatedness.3 Besides, the dream of the morphological-quantitative approach is that it will ultimately be capable of producing the rigorous, scientific form of the categories that guide its investigations, and thus cannot invoke these at its start as limits on its inquiry. The ethos of the explorer, which is to say orientalism, is not absent from Moretti’s work. We should keep in mind the complicity of these gestures with the absence of reading or nuance dominating his morphological project. Because of the undecidability of all conceptual distinctions, no criterion can be put forward for separating East and West (a distinction that is, in turn, undecidable). In “Network Theory, Plot Analysis,” for example, it is on the basis of a cursory reading of The Story of the Stone and a few chapters of Dickens that Moretti declares he has discovered “the opposite foundations of novel-writing East and West” (102). An East/West dichotomy structures the culminating conclusion of his Atlas of the European novel 1800-1900, which describes the global journeys of this peculiar European traveler, the novel: “The form comes from the center, and remains unchanging; while details are left free to vary from place to place” (193). As they disperse, things do not fall apart; the center holds. A classical, Aristotelian understanding of matter and form is here placed in service of a logocentric Eurocentrism, which is only heightened by restricting itself to Western Europe, primarily England and France. Form is intelligible and purely repeatable, unlike matter, which is essenceless this-ness. For Aristotle, form was masculine and matter feminine, because the man impregnates many women. For Moretti, all fecundity and rationality would belong to Western Europe, which remains the provenance of an incredibly vast field of diverse global production. Such universal and universalist conclusions are just as profound as they are superficial. As any good logician knows, it is sufficient to locate a single counterexample to debunk them, and of the many that could be brought forward Efraín Kristal offers an elegant example in “‘Considering Coldly...’ A Response to Franco Moretti,” which analyzes what Kristal takes to be homegrown innovations of Spanish American literature. In addition to this work, which is valid and important in the face of Moretti’s hegemonic claims, I would like to offer a conceptual critique. The morphological approach of Moretti’s work, which imposes the identity of the forms it recognizes on the objects it studies, is powerless to interpret the relativity of matter and form themselves. To take a classic example, if the brazen sphere is the imposition of a spherical form on brass matter, brass is itself a form imposed on a certain grouping of elemental matter, however we understand the number and identity of these elements. If the matter and form of world literature are similarly compromised and incapable of pure separation (isn’t it precisely centrifugal motion that is meant to separate the elements of a solution?) then it is impossible to rigorously separate the categories based on them, including male and female, east and west, as well as whatever components of a text are thought of as matter (or “detail”) and which as form, and the endless designations of genre grounded thereon. It may well be that nothing new comes out of the provinces—but this is true only to the extent that nothing new is ever generated at the center either, another way of saying that there is no certain and secure center, locatable as the progenitor of forms. The novel is a work of literature or art, some of the matter subsumed by this monstrous, spectral form, the map of whose vicissitudes would produce no certainty whatsoever as to the relationships of center and periphery. Are our desires determined, simply and purely, by national boundaries—by the lines on a map? Are we even certain that two people, whether from “inside” or “outside” the “same” nation-state, are ever enjoying the “same” book? Even if a scientific or quantitative investigation cannot discover a single letter, node, or degree of difference? If we invoked a moment ago a form subsuming that of the novel, it was to question the Franco-British source and unity of this form, as well as any claim we could make to all living within “the same world-historical whirlwind” (my emphasis). At the level of positivistic knowledge, novelty will never appear, which is why Moretti must accept the deterministic role of ready-made national and historical distinctions, and why the implicit transcendental unity founding them is “useless” for his science. We invoke the absence or abstention of this universal ground and unity to suggest that the play of form and matter will never reify itself at any level, certainly not with the blunt and hasty distinctions between syntax and lexicon, model and setting, or plot and character suggested by Moretti. Character is always typological, playing a structural role impossible to isolate from plot in a rigorous fashion. We could continue endlessly to attempt form/matter distinctions without reaching a secure foundation. Ultimately, we must sacrifice the idea of a form that is single, tied necessarily with national identity, and identifiable at the level of scientific knowledge. Any “micro-patterns” discovered by quantification will remain structured by the genre distinctions founding these investigations. Our argument is that these are never simply facts, inside or outside literature, wherever that may be. The very act of mapping it is a powerful reminder that the distinction meant to separate literature from other discourses, of being a text without an external referent, may not hold. The undecidability Moretti suppresses remains as the endless deferral of the center, whose power is never a pure agency or sovereignty and never identifiable with any of its names or of those who speak in its name, who will never escape the periphery correctly identified as e-normous, that is, outside the law. 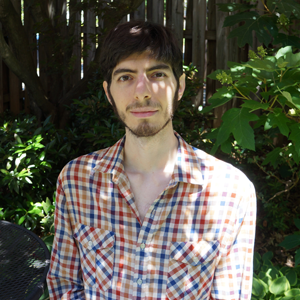 Jonathan Basile is a fiction writer, philosopher, and computer programmer. He is the creator and webmaster of an online universal library modeled after Borges’ “The Library of Babel,” libraryofbabel.info, and a universal image archive. His fiction has been published in Litro and his non-fiction writing has been published in The Paris Review Daily. His work has been exhibited at Recess Art, Good Work Gallery, and Trestle Gallery.